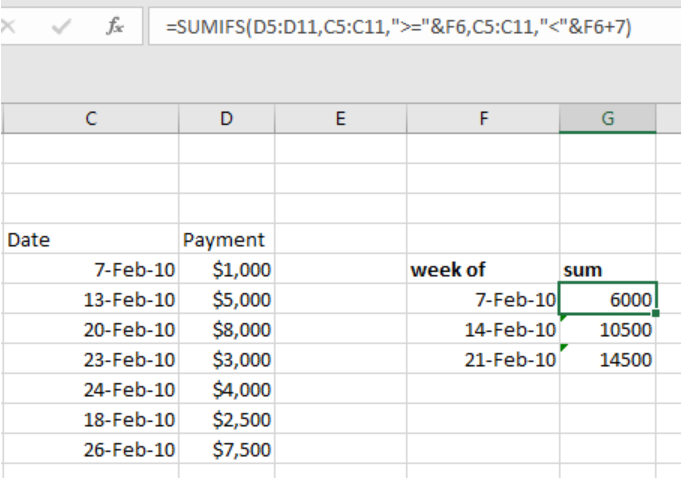 We can now use a formula based on the excel SUMIFS function to sum by week. This article provides a clear guide on how you can use the function to sum by week. The SUMIFS function plays a critical role when it comes to summing values by week. In our example above, we have found the sum of the payments by week. dates that are equal or greater than date in column D.
After we have found the sum for the first column, we need to copy down the formula to the other cells to get the sums for the other entries. Step 2: Indicate where you want the results to appear, in our case, the results should appear in column G.
Need formula at E7,F7 against D7 criteria and E1 Criteria and take sum by looking at raw data C column , M column and L column to determine how many hours worked by that particular week. I have a list of staff initials a two week timetable and two locations (e.g.Locations identified by cell color or text color) how can i count/sum which staff member has chosen which locations by putting colored text in a session. Convert days into weeks. Exercise it by week and sum the amount. I need help with a formula. I need the formula to read a date and return the data for the line and column. i also need it to return the sum of the column by week, by month, by year. I have the daily data worked out by changing the date in cell A2. I can not figure out the week, month , year sums.